Parallax One is a WordPress theme developed for site owners that want to present their site in a way that impresses their users. It uses stunning presentation effects like parallax scrolling that makes large images in the background appear as if you are seeing a scene in 3D. Read this article to learn more about the parallax effect and how to use and configure the Parallax One theme features in your WordPress site. Parallax One is a free WordPress theme developed especially for users that like to cause a good impression with their sites. This theme is a completely responsive and enables users to customize every page element. By using unlimited color options, users can create a beautiful unique Web site with smooth parallax effect. This theme was created to generate clean and validated code, which makes it easy for everyone with enough HTML and PHP knowledge to edit the code. The Theme Options Panel makes it easy for everyone to update the Web site settings. It is also localized to many languages, so everyone who doesn't want their Web site to be in English, can use translations of the whole theme built-in text without modifications to the content. The theme is also compatible with all major browsers. In this tutorial I will show you how to install and customize this theme in your WordPress site. To understand the visual presentation of this theme, it is useful to understand the principle of parallax itself. Allow me to quote the Wikipedia for a more technically accurate explanation. This means for instance that in an animation, the parallax effect can be observed by the different views of objects at different distances. Nearby objects seem to move faster than distant objects. You can observer this effect for instance during a car or bus trip, through your side window. In computer graphics and web design, the principles of parallax are used to implement the parallax scrolling technique, like for instance to watch different objects passing by with different speeds. Using this technique, background images move faster than foreground images when scrolling. This creates an illusion of depth in a 2D scene, which adds to the immersion of the user. This theme uses special CSS styles to show parallax effect to show impressive background images made of different layers of images that represent buildings or objects at different distances, giving the user a great sense of quality of your site presentation. Before starting the installation, we need to download our theme, so we can upload it to our WordPress site. This can be done by going to the theme page . When you open this link, you will need to click on the button that says DOWNLOAD NOW FOR FREE. It will open a pop-up, where you need to insert your registration information. This operation will result in opening a dashboard as a logged in user, where you can edit your profile or download your template files. Of course, we need to do the second thing, so just go and click on the DOWNLOAD FILES button. That will result in opening a new page named as Purchase history where you can view the history of your purchases and your recent purchase: the free Parallax One theme. Find your theme under Your Purchases and click again on the Download button. Finally, you have your file. Download it on your computer. Log in to your WordPress Web site www.yourdomain.tld/wp-admin, where you can enter your access information. After a successful login, go to the Appearance section in the left menu. By clicking on it you will be redirected to themes page where you can select one of different themes available for your Web site. Here you can add a new theme, the one you downloaded. By clicking on Add New you will be prompted to choose between hundreds of different free themes or to upload your own theme. Click on Upload Theme and choose the file you downloaded from ThemeIsle site: the free Parallax One theme. That process will upload the theme files to your Web site server and install it instantly. After a successful installation, you will need to click on Activate to activate your new theme. Parallax One provides different features for you to customize. With the unlimited color options, unlike other themes, Parallax One has an advanced theme options panel that enables you to easily customize every element with the color that you desire. You can also customize backgrounds and text boxes. Under the Appearance section in WordPress administration panel, you will find a link named Customize in the left menu. Click on it to open the free Parallax One customization panel. Here you can customize the appearance, your header section, service section, about section, team section, testimonial section, general options of the theme, colors, widgets etc.. You can also add custom menus and widgets or even change colors and backgrounds. What this theme has but many others don't is what makes this theme so special. Let me give you a quick overview of some of the special features this theme has. That will prevent loosing any changes you make in the template from being overwritten when you make an update of the theme. So next time you can update the theme and not loose all your custom changes, which happens frequently with other themes. What is great also in this theme is that it supports any language you want. It provides an easy way to convert your site to any language. There is no need to edit any files or look for the location of some text for hours. This theme is very fast, but you can make it even faster. With simple instruction steps you can make your Web site become a speedster. With this theme you can control everything. You can change the dimensions of the pages footer, change the size of the social icons, change the order of the sections and rearrange your menus and anchors. 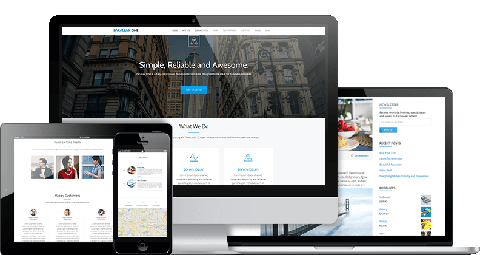 The Parallax One theme is an awesome WordPress theme that cause a great visual impression to your users thanks in part to a stunning implementation of the parallax effect. What I liked most about this theme is the very good support that you can get from ThemeIsle, the company that created this theme. I have requested their support and they replied to me very quickly. They provide 24 hours, 7 days a week free support, as well a lot of documentation available on their site. They also provide a dedicated forum for this theme where you can ask the community if you encounter any problems on this. So, if you liked this article or have questions about the Parallax One theme, post a comment here.